In his final blog post of the week, Michael talks about the plans he had to interview Tom Petty, and how his book changed after Petty’s sudden death. I signed the contract to write Southern Accents in November of 2016. In early 2017 I reached out to Petty’s camp to see if he would be willing to meet with me. I waited those couple of months because I wanted to be sure of what I thought about the record. I didn’t want Petty to have an outsize influence on my thinking at such an early stage of writing. Anyway, as I discuss briefly in the book, Mary Klauzer—who has worked in Petty’s management office for decades—sent word to Petty that I wanted to meet. Klauzer and Petty were particularly intrigued that I was asking to talk about Southern Accents. According to Klauzer most writers who tried to speak with Petty want to talk about Wildflowers or Damn the Torpedos. I suppose it pays to think about what a musician might themselves be tired of thinking about. In any event, Klauzer told me that Petty was “eager” to meet with me, but that I would need to bide my time. A few days or a week or something after our email exchange, Petty was being honored as the MusicCares person of the year. Then he was going into rehearsals for the 40th anniversary tour. Then he was going on tour. Petty, Klauzer told me, would be happy to meet after that and that I should write to her around the first of October 2017 to lock in the details of my visit to his place. At 2:26pm on Monday, October 2, 2017, I wrote to Klauzer asking to work out the details of the meeting. Exactly one hour later, at 3:26pm, I wrote another note expressing my sadness and condolences and telling her to forget about my meeting request. At that point, the news was conflicted but it seemed that Petty might survive. The next day, I think, news of his death came out on the wire. Now, I’d told everyone I spoke to about the book that speaking with Petty was not a requirement. It’s not that kind of book, I’d say. That was something that I believed. Still, knowing that Petty had been not only willing but enthusiastic about meeting to talk about the record was a throat punch. Not that the book wouldn’t happen but that I was missing out on the chance to talk to a man whose career had meant a lot to me about what I find one of the most fascinating aspects of that career. Petty’s death changed the terms of the book in a way that I didn’t realize for some time. The fact that I initially embarked on an exploration—personal and cultural—of one aspect of a working, creating musician’s life, morphed into the fact that I was now dealing with a frozen-in-amber moment of an artist’s now concluded life. 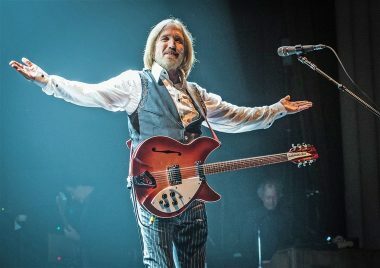 There was now an endpoint which made all of Petty’s decisions about the record and touring with the Confederate Flag that much more immovable. In other words, if I ended up coming down hard on Petty—and there are moments in the book where I call his judgment strongly into question—there was to be no coming to terms with the past, either through my interview or, more realistically, in his subsequent work. In one sense this was freeing. It’s just a fact that it’s easier to write about someone who has already passed away. That isn’t meant to be ghoulish. It’s just fact. In another sense, however, this was constricting. Now I felt like I was in many ways casting a judgement on all of Petty’s music and career. Petty’s death would’ve brought these changes to the nature of the Southern Accents book regardless of Petty’s willingness to meet with me, I think. 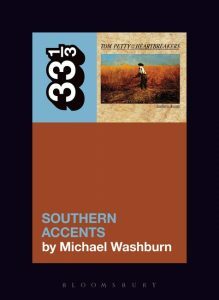 But if you decide to pick up the book—and I hope you do—you’ll find that the myth of Southern Accents is explored. It is, after all, a rock ‘n’ roll book. But it’s also an exploration of the ways we—all of us—make mistakes and how we choose to address, remedy, or ignore the mistakes that we make. I feel confident that if Petty were alive to read the book, it would be the same. But I feel good that as one of the first, if not the first, book published about Petty after his death, I can say that Petty’s late-in-life predisposition towards his Southern Accents era is a model most of us could strive to emulate. Thank you so much to Michael Washburn for his week of blogging! His new book,Tom Petty’s Southern Accents, is out now. Order your copy today.